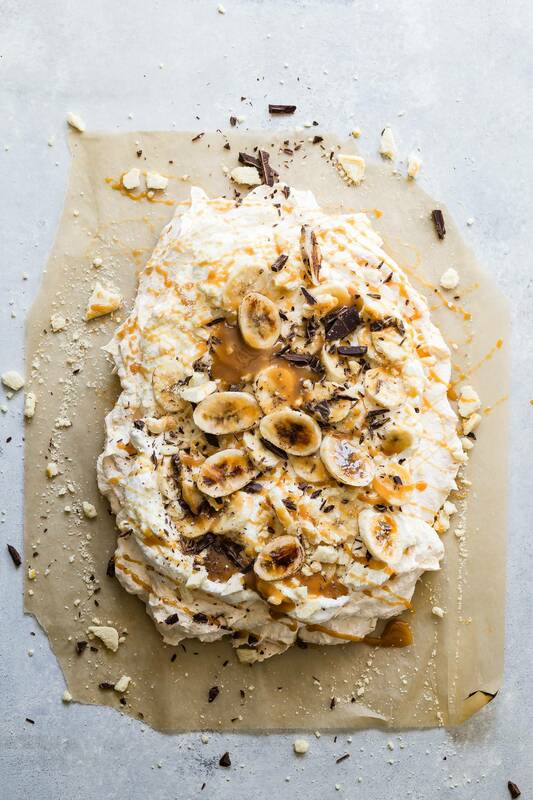 The ultimate Banoffee Pie Pavlova. Skip the pie and go with this crunchy, chewy meringue base covered in so many epic toppings. I’m not sure how many people have even heard of Banoffee Pie. It’s a popular european hybrid dessert between banana and toffee. It’s high up on the awesome list and it won’t be moving anytime soon. But I didn’t make a pie, shocker! Easter is steam-rolling in and what does everyone want after a hard day of egg hunting and chowing down tasty lamb? An easy dessert! 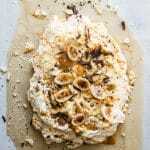 And that’s exactly what I delivered to your inbox with this Banoffee Pie Pavlova. The pavlova is basically a giant meringue, crispy on the outside but chewy on the inside. It’s easy to make but requires a few hours to dry out like any meringue, so prepare like a pro. 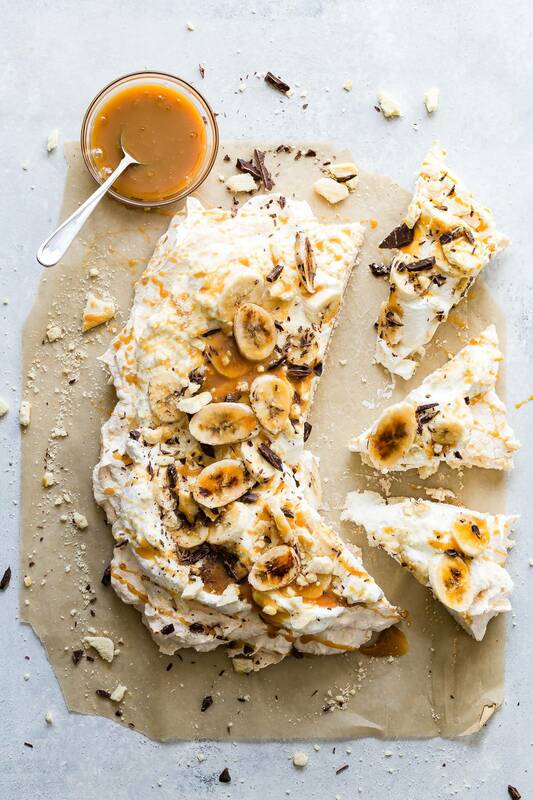 So how do we get the flavors and textures of a traditional Banoffee Pie into a pavlova? Easy, I have some deets. Take your meringue and cover it with heavy whipped cream. Lay on (lots) of banana slices and then cover with crushed buttery cookies to resemble the “pie crust”. Any buttery shortbread style cookie will work and don’t crush them too fine, you still want those chunky cookie rocks. Take your caramel sauce and drizzle as much as you like over the dessert. And don’t stress about making your own sauce, there’s plenty of really decent store versions available. Top with chopped chocolate and more bananas, if you own a torch sprinkle some sugar on the banana and caramelize them like you would do with a creme brûlée. This is totally optional but tastes so good and you can get all fancy and boss-like. Important pavlova rules- don’t build it too far in advance or the moisture from the cream will start to break down the meringue. You can have it ready to go an hour before serving and keep it in the fridge, but to enjoy that crunchy meringue I’d wait until last minute before throwing on the toppings. 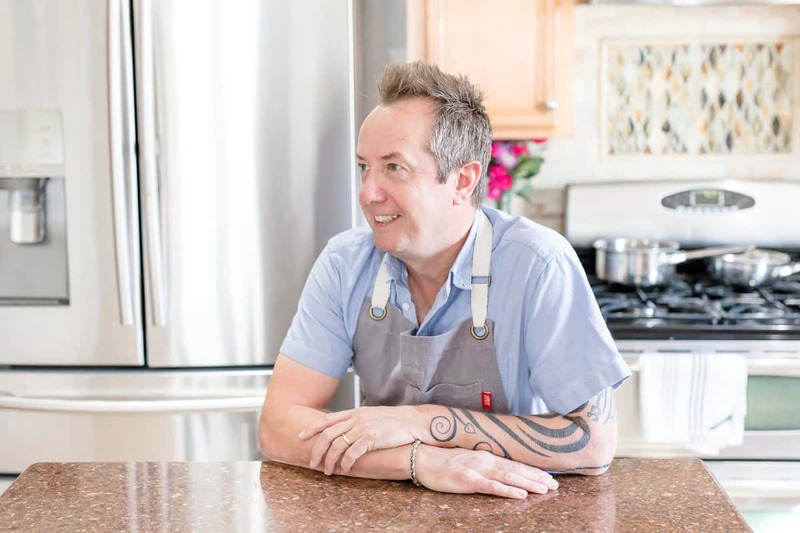 The longest stage of this recipe is letting the meringue cool so remember that. Who needs berries on their pavlova now? Preheat oven to 250 degrees and line a baking tray with parchment paper. In a very clean stand mixer bowl, whisk the egg whites until frothy. Start to sprinkle in the 1 cup sugar gradually until the meringue is at the stiff peak level. Transfer the meringue to your baking tray and spread it out with a spatula roughly until about 12 inches by 8 and an even thickness. Place in the oven and bake for 1 hour and 15 minutes. Turn the oven off and leave the door open slightly to let it cool. You can do this overnight but the meringue must be allowed to cool completely. Once the meringue is cool, clean the mixer bowl and then beat the cream and sugar until soft peaks have formed. Spread the cream on top of the meringue spreading it out to almost the edge. Slice one banana and lay the pieces all over the cream then add the crushed cookies. 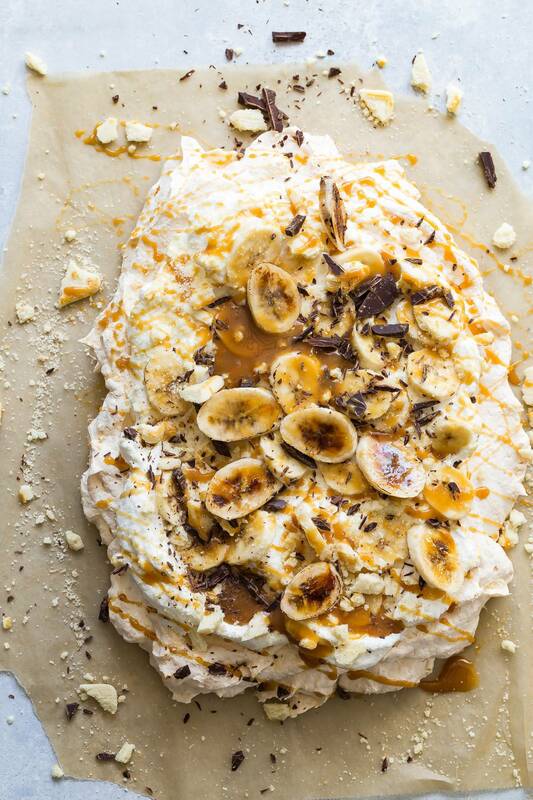 Top with more sliced banana and then drizzle the caramel sauce all over the pavlova. Basic Pavlova recipe from The Joy of Baking. Now this is a killer Easter dessert! I know know what I love more – the chopped chocolate or the caramel drizzle. Either way, this is a must make!